i7 980x Now or Wait for Sandybridge? In regard to 3D rendering, the Core i7 980x is 18% faster on the Cinebench R10 multi-threaded test. On the single-threaded test, the 2600K is 18% faster than the 980x. I'll find another website review that uses, say Premiere Pro and its Mainconcept h.264 encoder in Adobe Media Encoder. Eventually somebody will post results on the PPBM5 benchmark site. It looks like even the i7-2600K is only at about the same level of performance in CS5 as an i7-950 (stock to stock). But the 2600K beats the 950 in everything else. I only found one or two websites that benchmarks the new Sandy Bridge Core i7 2600K and Core i5 2500K with regard to Adobe Media Encoder or Premiere Pro CS5. The vast majority of reviews for PC hardware usually test either 1) x264 3.03 or earlier 2) Handbrake with some version of x264 3) WMV 4) Cinebench and maybe 3DS Max benchmarks. Our first media encoding test uses the latest CS5 software from Adobe. This software accesses all of the cores/threads available on our processors and is therefore an ideal application for media enthusiasts. To test performance we run a 1920x1080 file (custom recording) through the encoder set to 1080p 24 HQ using the H.264 Blu-Ray codec within the application. They tested with a Core i7 875K (2.93GHz , close to the Core i7 950 of 3.06GHz), which has a deficit of 16% stock clock speed from the 3.4GHz of the Core i7 2600K. In Hardwareheaven.com's test, the 2600K had a time of 1m32s, and the 875K had a time of 1m43s, only 11 seconds difference, or about 12% difference (and this is before 875K clock speed deficit, which makes the 2600K result less impressive) --- But you have other benchmarks where the 2600K exceeds the 875K, 950, or 980x. What's more impressive is the Sandy Bridge mobile parts, including the 2nd from the top model, the Core i7-2820QM, which is supposed to be equivalent to the previous laptop CPU, the Core i7-820QM. The mobile i7 2820QM is actually FASTER than my desktop i7 920 in many of the benchmarks, which is crazy --- I'd have to check if the original laptop Core i7 720QM,740QM, or 820QM were faster than the Core 2 Quad 9xxx or Q6xxx desktop CPUs. I'll see if I can find more benchmarks. Kitguru.net has a benchmark with Premiere CS5, but for some reason the benchmark graphic only includes the 2500K cpu, without comparing it to either last generations' Core i7 or even AMD processors. Weird. I think the OP (Renat) will be happy with the Sandy Bridge 2600K at $320, as I'm not sure that the $1000 980x is worth 200% or 3x the price premium for likely less than 30% performance improvements with CS5 (and less parallel workloads will favor the IPC of Sandy Bridge). Even my old i7 920 handles Renat's workload of 17Mbit AVCHD pretty easily at stock 2.66Ghz speeds. And should Renat need something exotic like dual or triple full bandwidth PCIe 2.0 x16 slots, there will be P67 Sandy Bridge options from Gigabyte, MSI, Asus that can supplement it with either Nvidia's NF200 or LucidLogic's exotic option (whether X58, P55, or new hotness P67). Renat's original option of going X58 / 980x route included the Asus Rampage III board, which already has the "exotic" NF200, and is $300ish. For myself, I'll upgrade my i7 920 and old Gigabyte X58-UD5 motherboard (original launch date from 11/2008, no USB 3.0 or SATA 6G) to this. Maybe Q4 2011 will not only have the X58 replacement (called Socket B2 or LGA1356 versus LGA1366 Nehalems or Westmere) equivalent Sandy Bridge, but hopefully a six or eight core (hopefully) extreme edition compared to the current Core i7 980x. And after you've added those HDDs and the other bits and bobs don't forget to up your PSU to at least 850 watts or more. This makes CUDA look like a Celeron processor. I wouldn't go running to get a new SB CPU but wait until Adobe CS6, which, I hope, should have Intel's new acceleration enabled. However, for those who encode to multiple formats, I would consider building a PC with a new SB i7 just for encoding. I only skimmed the same Tom's article yesterday so correct me if I misunderstood, but from what I recall I'd agree with Steve that Quick Synch is of possible FUTURE benefit but won't help current pro NLEs. Don't have time to re-read the article this morning, but my recollection is that software has to be specifically coded to take advantage of Quick Synch (which current pro NLEs wouldn't be) and if you use a graphics card rather than the on-chip video, Quick Synch would be disabled along with the rest of the chip's video subsystem? Also, I was left wondering if editing functions on the timeline would be able to access Quick Synch similarly to how effects can be accelerated by CUDA to give that delightfully smooth editing experience we can now enjoy. In other words, it isn't entirely clear quite yet that software access to the Quick Synch function is broad enough to do more than hard-coded renders. TBD, unless someone picked up additional tidbits about QS? Quick Synch probably won't be of practical use to us for a while; maybe in a year or two, or maybe not. Sandy Bridge overall is a nice step forward in Intel's architecture but I think that for a while yet the i980X will still be the best single CPU desktop solution (at a handsome price). If you're in the i950 or lower budget range, the early benchmarking indicates that current Sandy Bridge setup might come close to competing without being a slam dunk. I'd sure love to have a new Sandy Bridge to replace my old daily use computer, though! The PPBM5 results list now includes two i7-2600K Sandy Bridge systems. A Sandy Bridge 2600K @ 3.9GHz with only 8GB of RAM and a more reasonably priced disk subsystem actually beat my overclocked i7-920 (3.7GHz) with 12GB of RAM on the PPBM5 list. Overclocking my 920 or 950 to 3.9GHz delivered very little performance gain versus the additional heat that such overclocking of such older-design CPUs produced. The config that's heavily overclocked (4.7GHz), equipped with 16GB of RAM and a hardware RAID card with eight SATA hard drives came out very highly on the list, if not at the top of the list - this despite the relative lack of total PCIe 2.0 full-bandwidth lanes in that platform (remember, the LGA 1155 platform effectively has only 20 PCIe 2.0 lanes total because four of the 24 theoretical maximum PCIe 2.0 lanes are taken up by a USB 3.0 controller, a PCIe-to-PCI bridge controller and an additional SATA controller). The trick to achieve this level of performance is to get a motherboard that has one PCIe x4 slot in addition to the PCIe x16 slot, and not to allow that PCIe x4 slot that the hardware RAID card is plugged into to drop to x1 bandwidth by installing anything into the PCIe x1 slot(s). The PPBM5 results list now includes two i7-2600K Sandy Bridge systems. A Sandy Bridge 2600K with only 8GB of RAM and a more reasonably priced disk subsystem actually beat my overclocked i7-950 on the PPBM5 list (both CPUs were at roughly equal MHz speeds). I think too much emphasis is put on the PPBM results because they only test tasks most of us run overnight. However, it is a great resource/guide for PPro users and it does a fantastic job of explaining the results and how to apply these results to your own PC. I think a footnote should be added on the home page telling people that using a dual-core cpu, 2GB ram and 1 drive WILL cause many PROBLEMS in addition to installing tons of crapware. Too many people have user crap PCs and with crapware and then complain about it, which has given earlier Premiere versions a bad rap. Not to mention, faulty hardware such as video cards and ram are difficult to test because they can appear as very random issues. I bring this up because I have had both a bad stick of ram and just recently, a bad Quadro. The bad Quadro caused problems mainly with AE, which then caused me to think that Adobe made an unstable program. During the last week of using a new Quadro (got to love HP warranty-talked online at 4pm and had a new Quadro the next morning at 10am), I have not had a single problem with AE or any BSODs. I think a great test would be testing the quickness of playback of various formats which should provide a good evaluation of both the processing power and disk subsystem for certain formats. Furthermore, if there was a simple way to test everyday editing tasks, that would be awesome. 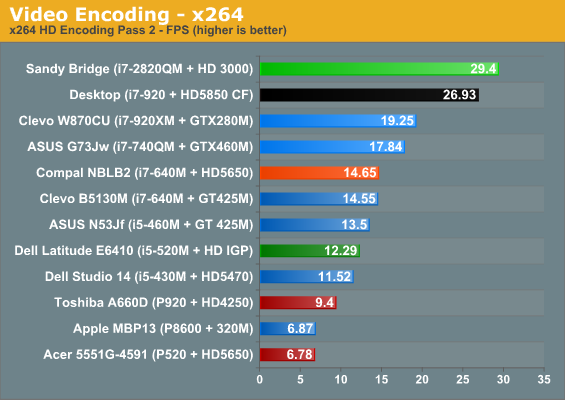 For fellow AE users and even Encore users, a Dynamic Link test/benchmark would be great. Plus, just AE benchmarks would be great because that program really uses system resources much more heavily than any other Adobe app. One easy test for AE is hitting zero '0' to render a comp of at least 20 seconds to see how quickly and how many of those 20 seconds the computer can cache in ram. Hitting zero is a very common task for AE users. Hi, here we speak about quickness of i7 2600k but how much will it be stable for making video editing? For those waiting or bought a Sandy Bridge cpu and are looking at RAID cards, the Tech Report did a quick test with a Marvell SATA controller on the PCIe 2.0 x1 slot (theoretical bandwidth 500MB/s) and a OCZ SSD. Unfortunately they did not test the x8 slot with an Areca raid card. I have both a Core i7 920 and i7 2600K, so I'll try to run PPBM on it. Unfortunately they did not test the x8 slot with an Areca raid card. This is because the PCIe x8 slot on P67 motherboards shares bandwidth with the primary PCIe x16 slot that's used for primary graphics cards. Thus, if any card is plugged into that x8 slot, the primary PCIe x16 slot also drops down to x8 mode. And keep in mind that the LGA 1155 Sandy Bridge platform has a maximum total of only 24 PCIe lanes. However, most motherboard brands (including Intel itself) eat up four or five of those 24 PCIe lanes with onboard USB 3.0 controllers, PCIe-to-PCI bridge controllers and extra SATA or eSATA controllers (and often an onboard PCIe NIC). That leaves only 19 or 20 PCIe lanes available for expansion cards. Third-party repeater chips such as Nvidia's NF200 can add additional PCIe lanes to the LGA 1155 platform - but they fail to solve the limited total bandwidth of the LGA 1155 CPU's integrated PCIe controller. They effectively convert 16 PCIe 2.0 lanes into 32 PCIe lanes that are artificially restricted to PCIe 1.0 bandwidth. i am skipping sandy bridge and waiting for the X58/socket 1366 replacement. not worth the money at this point. Actually, none of the other current CPU platforms are worth anywhere near their current street prices, for that matter. If anything, all of the other platforms provide much worse performance-per-dollar ratios than the Sandy Bridge at this point (at least at their current street prices). The i7-950's price, for example, seems to be the starting point for the higher-end platform - but then, I would have needed to spend more than $300 on a motherboard that can overclock the CPU above 3.6 or 3.7 GHz without requiring a massive increase in the CPU voltages. And at my maximum "safe" overclock for the entry-level LGA 1366 CPUs on such lower-priced (~$200) motherboards, the system still performs slower than even a slightly-overclocked Sandy Bridge CPU in most applications. That is exactly what makes the LGA 1366/X58 platform a relatively poor value if one is to buy or build a completely new system today. But then again, it is currently the only viable choice if one wants to add both a better sound card and a discrete hardware RAID controller card (the latter is required for LOVE, a/k/a "Laughing Over Video Editing", disk setups) into the same system without having to spend an astronomical amount of money. Do that with current Sandy Bridge platforms and either the disk performance or the MPE GPU performance will suffer. In other words, the LGA 1366/X58 platform is still a waste of money if one is planning to stick with a KISS ("Keep It Stupidly Simple") disk setup for the foreseeable future. However, it is currently the only non-astronomically-expensive choice if you are going with a KISS setup with the intention of upgrading to a LOVE setup within the next several months (or whenever funds permit). However, if you already own a Core 2 Quad or better, you might as well hold on to it for a little longer unless you really need an up-to-date system right away (most likely because your current system has been having serious stability issues that cannot be easily solved). Last edited by Randall Leong; January 19th, 2011 at 01:13 PM. i understand that; i bought my components out of desperation because my home PC, which was a 2007-ish Q6600 with 8GB of RAM died and it was more cost effective to upgrade. i only used it for light video editing, but mostly as a home entertainment system and web surfing; so it was more than adequate. also the sandy bridge stuff was not out yet. I should have explained that i meant in my position i am skipping sandy bridge. IF i was in the market for a new home PC, i would go sandy bridge, same if one of the work machines died. as it stands, we will upgrade our work machines in about 8 months, hopefully to 8 core systems, and i will take one of the i7 980X systems for my personal PC. For our business systems we have i7 980X machines; one with 12GB RAM the other with 24GB RAM. both overclocked to 4.1Ghz. My sig system is only a web surfing/home entertainment system that gets light video editing done on it. I think i paid $375 for the motherboard and processor shipped, and $180 for the ram shipped, and donated the Q6600 system case/PSU/RAM/processor/accessories (dead motherboard) to one of my editors who only had a core 2 duo laptop. The i7 980X is HORRIBLY overpriced considering what sandy bridge is capable of; one could almost build an equal sandy bridge system for the $1000 pricetag. and the i7 970 is even worse; $800 and most cant seem to get it reliable over 4.0Ghz. I LOVE your 'KISS' acronym by the way! What I stated in my previous post clearly underscores the point that a PC that's used for serious video editing should not be used for anything else. You see, the older i7-920/930/950 is slower than even an i5-2500 for everyday applications when the CPUs are at their stock speeds - but then again, the i5-2500K runs at a stock (non-turbo) 3.3GHz versus 3.07GHz for the i7-950. What's more, a dedicated video editing PC should be semi-permanently disconnected from the Internet (this means connected to the Internet only if any part of that system needs software or firmware updates) since that PC normally should not have any antivirus or anti-malware software installed at all whatsoever, especially if that PC is normally connected directly to a broadband modem with no firewall whatsoever. This will minimize the risk of the dedicated editing PC being infested with malware and being hacked by outsiders. For many users, the only solution is two separate PCs - one dedicated to video editing, the other for everything else.